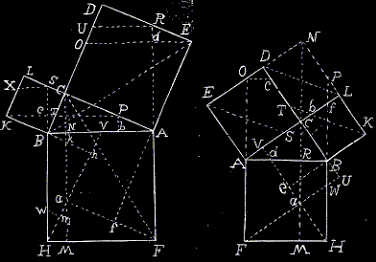 This is probably the most famous of all proofs of the Pythagorean proposition. It's the first of Euclid's two proofs (I.47). The underlying configuration became known under a variety of names, the Bride's Chair likely being the most popular. The proof has been illustrated by an award winning Java applet written by Jim Morey. I include it on a separate page with Jim's kind permission. The proof below is a somewhat shortened version of the original Euclidean proof as it appears in Sir Thomas Heath's translation. BAF = BAC + CAF = CAB + BAE = CAE. ΔABF has base AF and the altitude from B equal to AC. Its area therefore equals half that of square on the side AC. On the other hand, ΔAEC has AE and the altitude from C equal to AM, where M is the point of intersection of AB with the line CL parallel to AE. 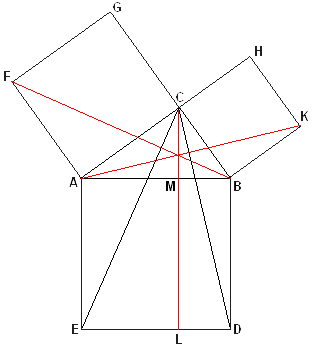 Thus the area of ΔAEC equals half that of the rectangle AELM. Which says that the area AC2 of the square on side AC equals the area of the rectangle AELM. Similarly, the are BC2 of the square on side BC equals that of rectangle BMLD. Finally, the two rectangles AELM and BMLD make up the square on the hypotenuse AB. As a last step, we rotate the triangles 90°, each around its top vertex. The right one is rotated clockwise whereas the left triangle is rotated counterclockwise. Obviously the resulting shape is a square with the side c and area c2. This proof appears in a dynamic incarnation.